Today's post is about a couple of awards that were passed on to me by three amazing ladies who are also bloggers and are oh-so-kind! I've been meaning to do a post about my awards, so I can proudly display them on my blog, but I never had the chance until today. This give me room to enjoy the Inspired by Huggies/Retro Polka Dots Manicure I currently have on! Now on to the awards. 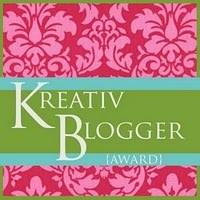 First up the Kreativ Blogger Award given to me by Shannara at Nails and Stuff. First question, and I'm thinking "this is hard". I have too many favorites. My favorite dessert changes depending on my mood. Lol... I currently am head over heels in love with cheesecakes though! I used to hate cheesecakes, but recently it's been a love affair. 3. What ticks you off? It takes a while before I get mad or get ticked off. Usually, it's the littlest things that drive me over the edge though. You could do something sooo big and mighty and it wouldn't affect me. But do something you might consider a small offence, and I might get ticked off. Oh.. Oh.. Wait, I just thought of something that generally ticks me off! Bullies tick me off. I seriously dislike bullies! Ohhhhhh, don't get me started on how much I dislike bullies! I am not, nor was I ever a victim of bullies, but I can't stand it when I hear the story of a child being bullied, or when I watch a movie where someone was being bullied. So yeah, Bullies tick me off! Generally try to pray about it first. If it's a person upsetting me: I tell the person that I'm upset and then I try to work things out. If it's not a person making me upset, I listen to music and remind myself that all things work together for good. It's easier on some days and harder on other days, but prayer helps me through. 5. What is your favorite pet? I don't have any pets. Come on Son! Lol.. Don't ask me that. I really don't have an answer to this... wanna know why? Check Isaiah 41:10. Really I try not to let my fears get the best of me, or become BIG enough to be considered a "biggest fear". Try your best and leave the rest. This Blog and everything it represents. Nail polishes, more nail polishes, more nail polishes, Shopping, coupons, discounts, freebies, and more nail polishes. *Sighs*. 1. I love to laugh A LOT! (So all the "Lol's" You see on my blog are not just to fill up spaces... I'm really laughing..lol). 4. I love God and trust in him. 5. I am originally Nigerian (I was born in Nigeria, lived there a while and moved to the U.S). Wow. That was the shortest I ever told the story of my car accident. I Hope I haven't awoken your curiosity? Lol... Now you wanna know more ehh? Oy! Ask away if you do. Don't be shy, I don't think any question is "stupid/silly". Well, Now.. to blog about my other awards or make it into another post? This post is long enough as it is.. and if you're like me... You are probably.... uhh.... yeah... hello??? Are you still there?!?! LOL... Okay, now that I got your attention, I shall merge all awards! Most of the questions are the same, and the rule is kind of the same as well. Alright.. Let me fetch the questions that aren't the same from the second award. This second award was given to me by the lovely Ashley at Art Evolve. To read the full rules of this award, please visit this link on her blog. As I stated, I'll answer only the questions that are different from the ones in the Kreativ Blogger questions above. My M.A.C powder and Ruby Kisses Lip gloss. I don't really follow trends, but I learned about holographic nail polishes in 2011, and I must say, they are currently an absolute favorite of mine. Uhmm... I shall not disclose this for privacy reasons. TMI, IMHO. Lol..
6. What was the last song that you listened to? Well, it's the Youtube song I posted at the beginning of this post. Praise is what I do by William Murphy. I'm not big on animals, but I've been known to love certain cute little dogs. Phew, that wasn't so bad. The rest of the questions in the Cute Blog Award are the same as those in the Kreativ Blog Award. If you want to answer the questions to this award, please visit Ashley's blog to get the full list of rules and questions. Edit: I got another award, and decided to merge it in this post as well. 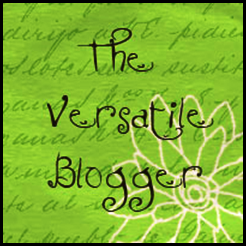 Finally, The Versatile Blogger Award was given to me by Ms. Lizard over at Nails by Ms. Lizard. The rules in this award said I should say 7 things about myself, which I already did. Also, I pass this award on to everyone who blogs regularly or about many other different things. I actually have two people in mind I want to give this award to, because not only do they blog about nails, they blog about so many other things. I give this award to Oreleona at The Pristine Notion and Yolandaas at Pink and Leopard Prints. Once again, I'd like to thank Shannara, Ashley, and Mz. Lizard for these wonderful awards, and for the opportunity to be able to share more about myself with you lovely people. Thanks for reading. Till later, God Bless. Holly, Indeed, Indeed. The good times, the good songs. Not all these garbage we hear nowadays. *sigh*..
Congrats on the awards! I liked reading your story! Yes, the cyber-bullies are also getting to be really bad. I don't understand why kids and even adults are being mean to themselves. It's unnecessary. I pray it all changes soon. Yeah Lizzy...it's just so repetitive/unoriginal/annoying or maybe it's just me getting old LOL. I love getting the awards from all my wonderful lady blogger friends, but when they are repetitive and so much the same, it's not as much fun. Yes, Yes, the songs... I can't remember the last time I heard a really good one. But they keep trying, so I'll cut them some slacks.